With so many options of video players out there, it’s hard to choose which application will be best for you. I would suggest keeping things simple and avoiding future headaches of video player upgrades, new features, and bug fixes. Stick with an online based video player that will take care of all of that for you and make your job easier. If you are in to easier ways of doing things and keeping things simple, you may also want to check out www.wix.com. Wix is an easy drag-and-drop online system that is unveiling a free HTML website builder on the 26th of March, 2012. Wix has already gained widespread popularity for their drag-and-drop Flash website builder that allows users to easily build complex, powerful, and stunning websites. Whether you’re looking for an easy way to put together site with a full screen background, or display your portfolio online, Wix is certainly worth checking out. It doesn’t matter if you’re a seasoned web developer or an ambitious do it yourself-er, creating a free HTML website or SEO friendly Flash website has never been easier. One of the most exciting new features to HTML 5 is the ability to handle audio and video with the newly introduced <video> element. This new HTML element allows developers to implement video on their site with minimal code. Before it would require a Flash or Java-based player, both which would then require the viewer to have some sort of third party plug in to make the video play properly. Then there was the issue of Apple giving no love to Flash, meaning if you were using a Flash video on your site and someone viewed it from an Apple mobile device the video would not play. 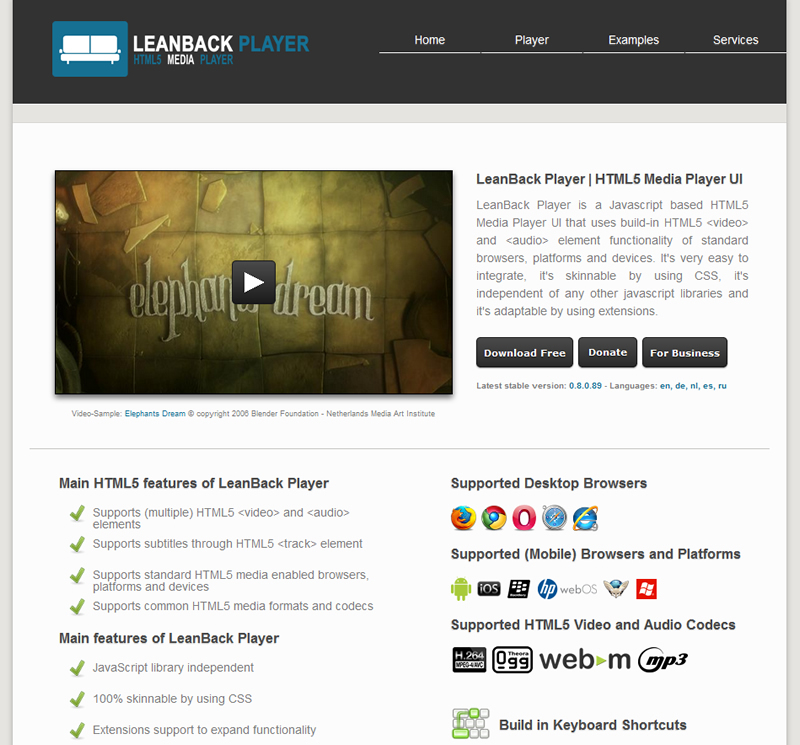 Several developers are already using HTML5 video players, and with good reason. I recently had a client request I switch their video player from their Flash-based player to a HTML5 player. The result was nearly 100 less lines of code and smaller file sizes. Developing a user friendly html website can be time consuming enough, so before you tackle a project like building your own custom HTML5 video player let’s take a look at 10 HTML 5 video players that are out there and see if they’ll do the trick.